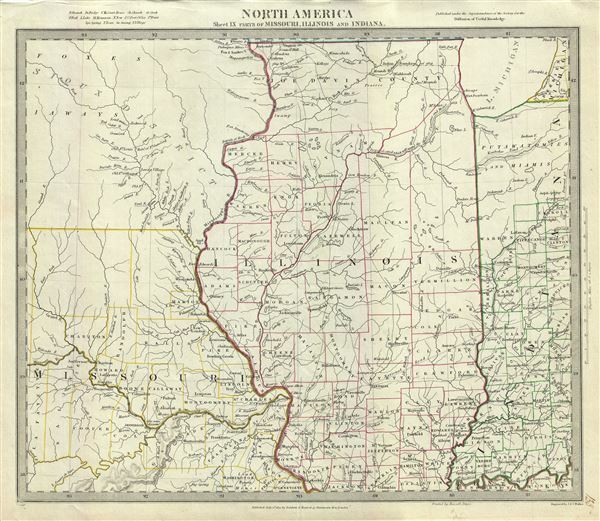 This is a beautiful 1833 map of Illinois, Missouri, Iowa and Indiana issued by the S.D.U.K. The map covers parts of modern day Iowa, Illinois, Missouri and Indiana from the Sioux Territory south as far as the Kentucky border and east as far as Lake Michigan. Depicts a very early county configuration. The map is particularly interesting and important due to its portrayal of the rapidly changing American Indian situation. Several Indian tribes are identified, including the Sioux, Foxes, and others. Published in 1833 by Baldwin and Cradock of Paternoster Row for the Society for the Diffusion of Useful Knowledge, or S.D.U.K. Although the Society formally closed its doors in 1848, subsequent reissues of the S.D.U.K. atlas were printed well into the 1870s by Chapman and Hall, who acquired the original plates.